Your active dog has unique energy needs. Feed him/her an enhanced-performance diet. 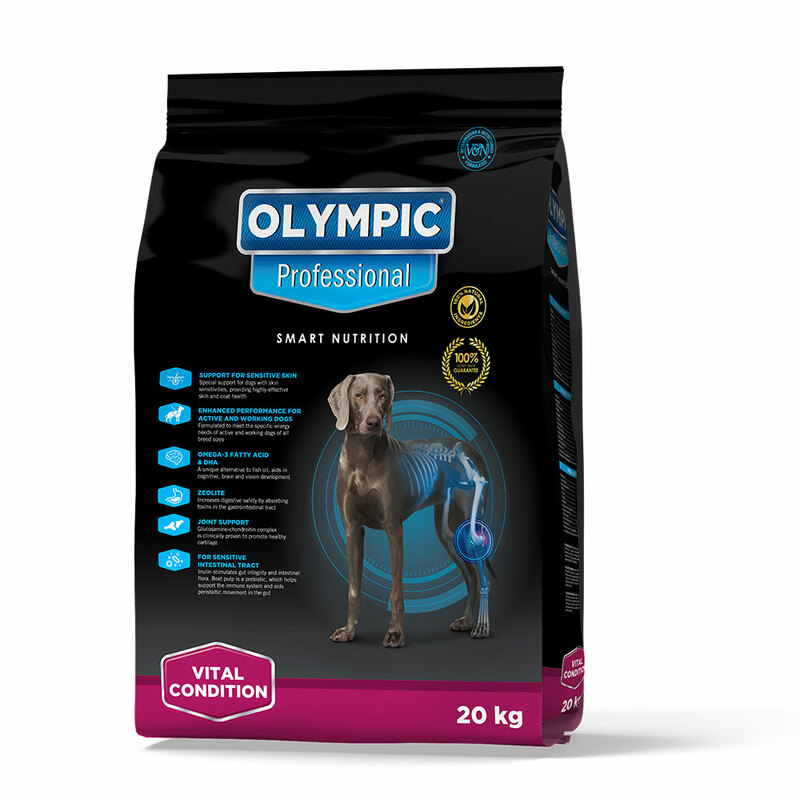 OLYMPIC® PROFESSIONAL VITAL CONDITION is formulated to meet the specific energy needs of active and working dogs of all breed sizes. The conditioning formulation offers special support for dogs with skin and digestive sensitivities, thus providing outstanding skin, coat and digestive health. Sensitivity control is especially focused on skin and gastrointestinal sensitivity and immunity. A sensitivity-controlled formula as it has no artificial flavours, colours or preservatives and contains no soy, pork, beef or fish meal. It is a wheat-free formulation. Exclusively poultry (made up of chicken, turkey and duck only) as its only source of animal protein. It is formulated to meet the specific energy needs of active and working dogs of all breed sizes. OLYMPIC® PROFESSIONAL VITAL CONDITION has high protein and fat levels to maintain and regulate energy supply during activity and work, which assists in delaying the onset of fatigue and in increasing endurance. Antioxidants to help scavenge free radicals produced by the increased oxygen metabolism of working dogs. Balanced optimal amino acid profile promotes muscle recovery. All-natural ingredients with added vitamins and minerals, making it 100% balanced and nutritionally complete. DHA is a natural source of long-chain omega-3 fatty acids. Inulin is a prebiotic and reduces offensive faecal odour while assisting in modulating intestinal irregularities. Beet pulp is a prebiotic and is a source of both fermentable and non-fermentable fibre. Zeolite increases digestive safety, absorbs toxic agents in the gastrointestinal tract, reduces flatulence as well as improving the odour and consistency of stools. Joint support is provided through a glucosamine-chondroitin complex that has been clinically proven to promote and maintain healthy cartilage. Maize, poultry (minimum 22% poultry), gluten, rice, poultry oil, beet pulp, poultry digest, inulin, zeolite, minerals, vitamins, glucosamine-chondroitin and approved antioxidants. Protein 26%, Moisture 10%, Fat 14%, Fibre 3.5%, Ash 7%, Calcium 1.2%, Phosphorus 0.8%, Ca:P ratio 1.6:1, Linoleic acid 1.5, DHA 0.15%, Omega 6:3 ratio 4 – 7:1, Vitamin A 30 000 iu/kg, Vitamin B complex 77 mg/kg, Glucosamine-chondroitin complex 400 mg/kg.